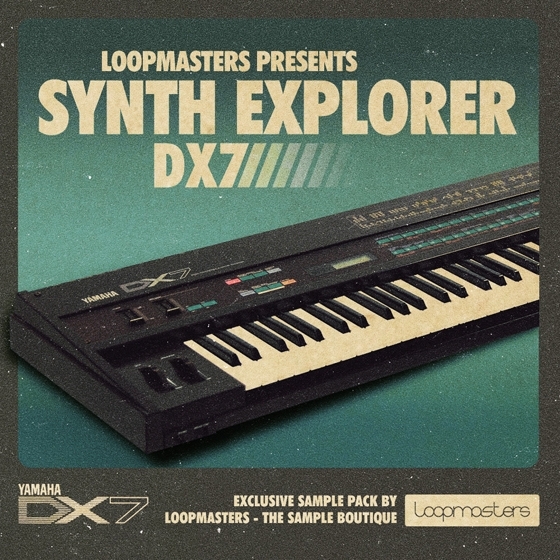 Welcome to the Synth Explorer series of royalty free loops and one shot samples that pay tribute to the legendry synthesisers and drum machines that have inspired generations of electronic music producers from the early electronic revolution right up to the current day. This time out we visit Yamaha and delve inside the FM beast that is the DX7. The Yamaha DX7 is an FM (Frequency Modulation) digital synth and was manufactured from 1983 to 1989. The DX became the first commercially successful Digital synth and featured in hundreds of productions from Electro Pop, Jazz, Rock and early 90s House music it in fact seemed to be everywhere.. It is most famous for its Electric Piano, Bells, Plucked and Percussive Sounds, but the complex way the sounds are shaped with multiple Sine Waves modulating each other using 32 different algorithms meant that the sound design possibilities were huge and with some patience and effort very complex sounds from horns to strings, atmospheres and crazy metallic sound effects were possible. This edition of Vintage Explorer sees a wealth of Loop and one shot samples that play homage to its 80s heritage but each sound and loop has been given a modern production finish and contains loops and sounds suitable for a wide range of productions from Dubstep, Drum & Bass, House, Future House, Indie & Nu Disco. In Detail expect to find 484Mb 24Bit 44.1kHz Loops and sounds including 13 Bass Loops, 73 Music Loops, 1 Drum Loop, 20 Arp Loops, 3 Pad Loops, 39 Bass Stabs, 29 Lead Sounds, 51 Pad Shots, 55 Synth Hits, 43 SFX Sounds, 5 Multi Sampled Bass Instruments, 5 Multi Sampled Synth Instruments, 59 Drum Sounds, 110 Rex2 Files and 202 Soft Sampler Patches.